If you find yourself in 99% of the criteria below, if you are already working in Corporate Events and passionate about what you are doing, if you want to grow alongside one of the most stable and professional Corporate Events Organizations in Industry, send us your resume. You will provide assistance for the event (the job involves traveling in the country and / or abroad at least 3-5 days per month, including weekends). 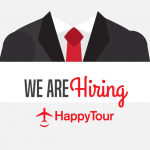 We are waiting for your application via email on office@happytour.ro.